5 Fantastic Hiking Areas in Phoenix - Top Ten Travel Blog | Our experiences traveling throughout the US. Although most of us associate Phoenix’s very long endless triple digit heat summer season with hiding indoors as much as possible, the milder fall and winter months are the time to get out there and explore the beauty of the Sonoran Desert. 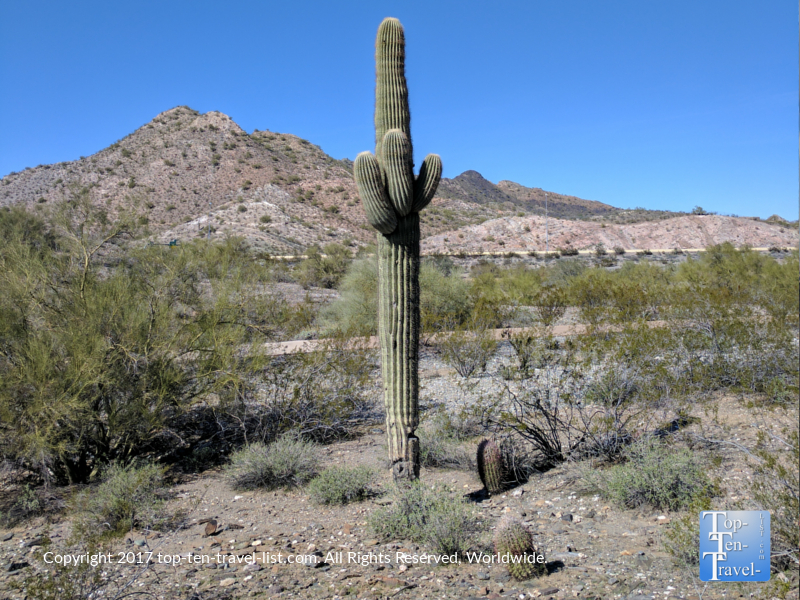 While Phoenix has lots of malls, chain restaurants, and seemingly endless suburban congestion, there are also many great hiking areas where you can completely escape the suburban jungle for a peaceful trek in the unusually beautiful cacti filled desert. 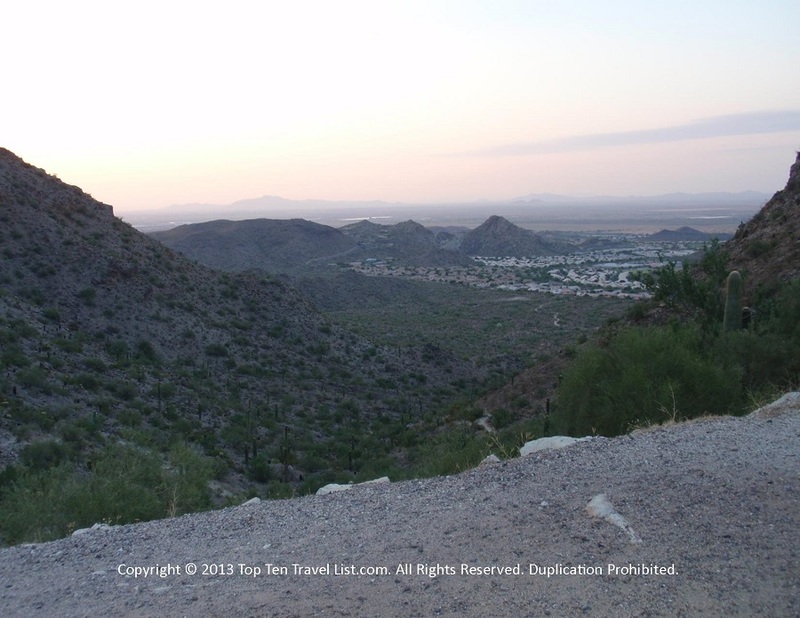 Below are my top 6 picks for amazing hiking in the Phoenix area. The Scottsdale McDowell Sonoran Preserve is by far my favorite place to hike in the Phoenix metro area. It’s quite aways from the city so it maintains a really peaceful feeling all the time. It’s never overly crowded, clean, and the trails are well-maintained and properly marked. At the preserve, you will find miles and miles of trails to choose amongst, all of varying difficultly, so you can take it easy with a nature or birdwatching walk, or go all out with an all day cardio session. 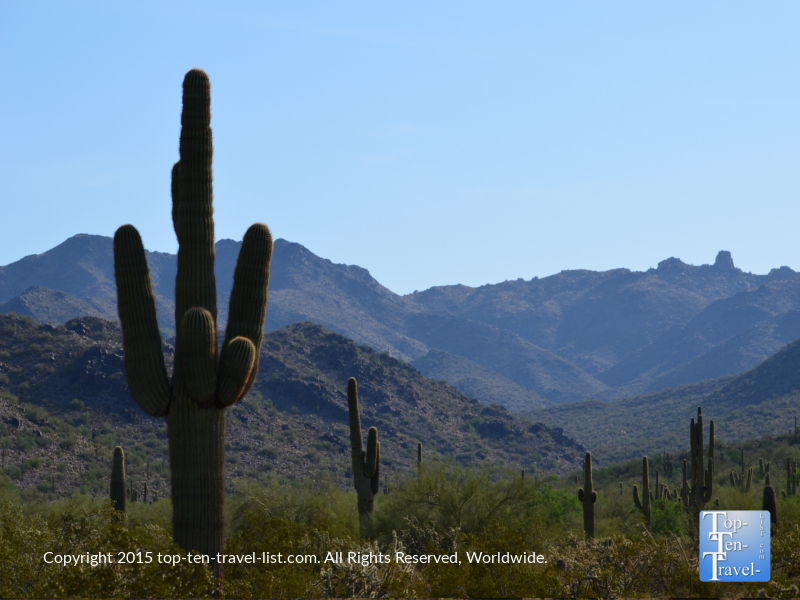 The mountain views are fabulous and the trails are loaded with tall Saguaro cactus. This monstrous 30,000 acre park is the largest urban park in the US and is home to over 180 miles of trails! Even the drive over is scenic as you will pass plenty of open desert land! Asides from hiking, the trails can also be used for horseback riding and mountain biking. A few must-do trails include the Lost Dog’s Wash Trail or the Gateway Trail. Like the McDowell Sonoran Preserve, South Mountain Park is another massive urban park with 16000 acres of land, making it the second largest urban park in the country. Asides from 51 miles of beautiful trails which are perfect for mountain biking or hiking, you will also find a scenic drive, where you will be treated to panoramic views of the city. Dobbins Lookout, at 2,330 feet, is the highest point in the park and can be accessed via trail or scenic drive. South Mountain is fantastic because even non-hikers can enjoy a day out in nature with a scenic drive, picnic, and stopping at various overlooks. One of the most popular trails in the park system and my personal favorite is the Kiwanis trail. 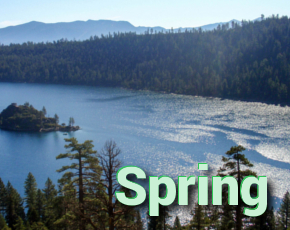 This scenic hike is short & easy enough to do anytime of year and one of the few that is doable during the brutal summer season (although you must still set out at 6am or so to beat the heat). The scenery along the way is beautiful, consisting of a mix of both urban cityscapes and peaceful desert views. Camelback Mountain is the hardest trail in the Phoenix area, as well as one of the most difficult in the country, and thus, it draws avid hikers from all over. The rough terrain combined with an elevation gain of over 1000 feet, and the addition of the harsh climate of the desert make this trail only for the most experienced hikers. At Camelback you will find 2 extremely challenging trails (the Cholla and Echo trail) which both arrive at the same summit. The summit sits at 2714 feet and offers a pretty fantastic view of the valley. Many visitors underestimate the harshness of these trails, with rescues and several deaths occurring every year. Out of all the hikes in the Phoenix region, this is one that you want to totally avoid during the summer season – it’s just too hot and dangerous with the risk of dehydration and heat related illnesses too high to chance it. However, if you do decide you are up for the challenge (during the cooler season of course), it’s a pretty spectacular hike with the most amazing views. On an interesting side note, the hike is named after its’ shape which resembles the hump and head of a camel. 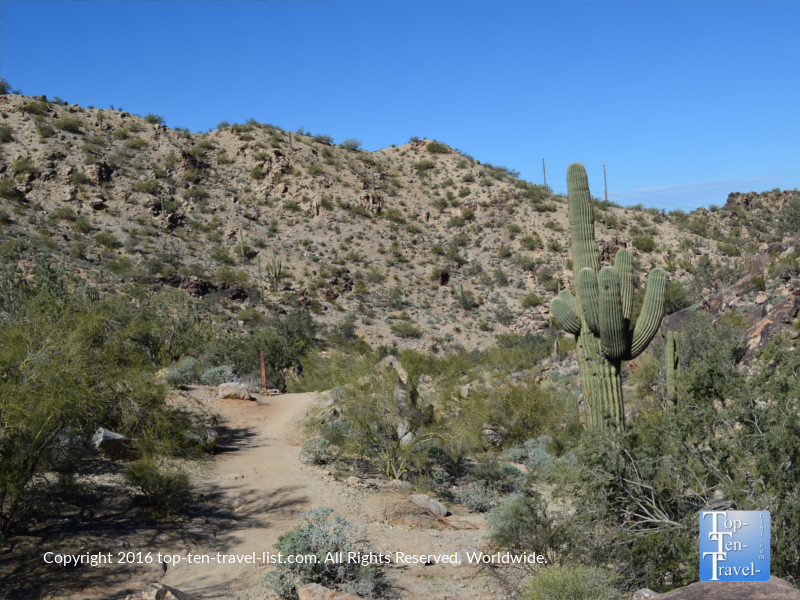 Usery Mountain Regional Park is a quiet little hiking oasis in Mesa. At just 3648 acres it’s quite small, however, there are plenty of beautiful trails of varying difficulty to enjoy. Surprisingly, the area draws little traffic despite being home to more than 20 miles of gorgeous trails. Trails range from under a half mile to 7 miles, so there is always something for everyone, regardless of fitness level. Usery is home to a number of short treks so you can still get out there early in the morning during the hot months if you want to get in a light workout. 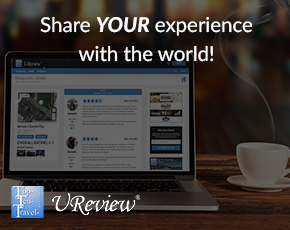 Any trail you choose will reward you with amazing views of the surrounding mountain ranges. 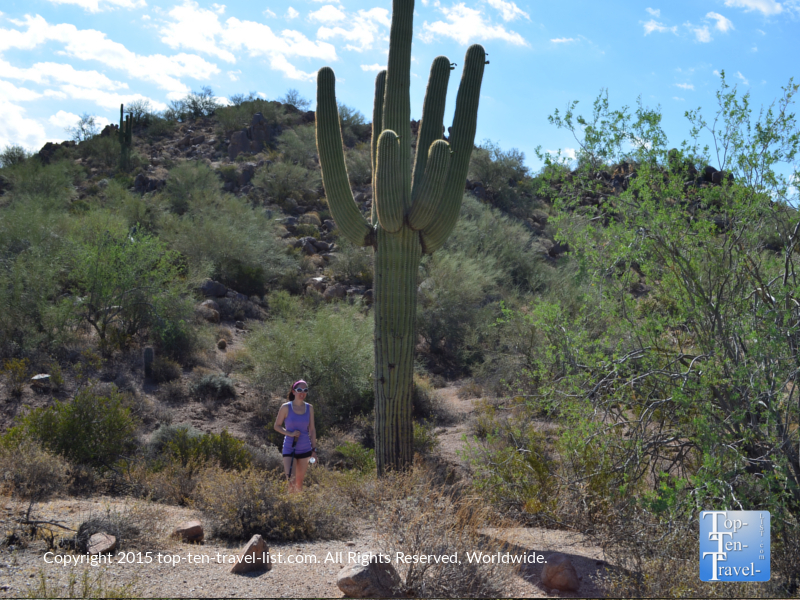 There are lots of beautiful Saguaro cacti along every trail, along with numerous other interesting varieties of the exotic desert. Plant life is surprisingly lush for a desert. If you are looking to escape the city congestion, Usery Mountain is as good a place as any to do it. The best trail in the park any season is the Merkle Trail. It’s short, very scenic, loaded with diverse desert plant life, and offers fantastic views of the mountains including the unique Phoenix air marker. Usery also offers an interesting lineup of annual events including fun night hikes, so be sure to check the calendar. The Dreamy Draw Recreation Area is a picturesque area which is home to a number of easy and moderate hikes. Dreamy Draw is a great choice if you are looking for easy nature trails as most of the trails are pretty short and moderate at most in terms of difficulty. It’s also a popular destination for trail runners and dog walkers, most likely due to the easy terrain. 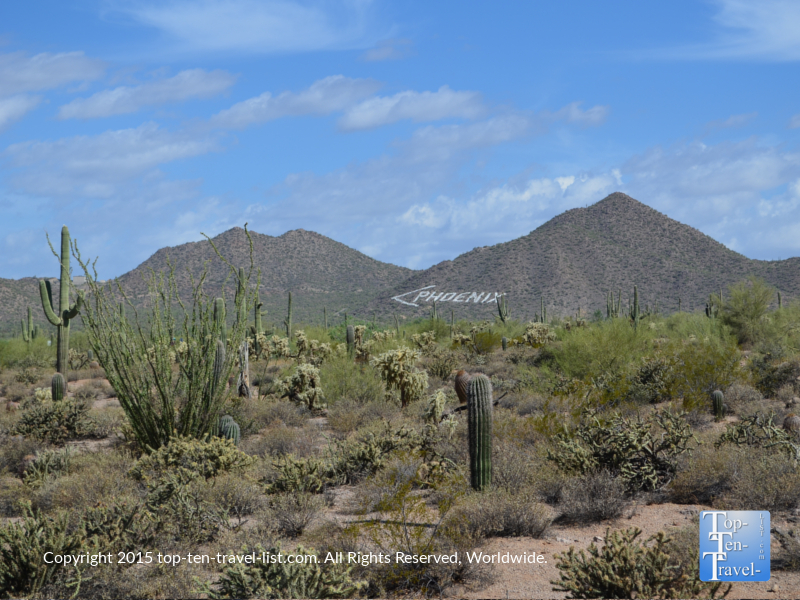 While the views are not the top in town, you will still get to see lots of cacti and enjoy some nice mountain views. Wildlife is pretty abundant, especially during the early morning hours. Another benefit of Dreamy Draw is the easy access from the city, so you can get in a quick workout without a major time commitment. One interesting aspect of this area which makes it stands out from all others is a supposed alien landing 60 years ago. Legend says that there is a 36 foot spaceship buried beneath the dam. In 1947 (the same time as the Roswell crash), 2 UFOs were also sighted in the Phoenix area, one in the Dreamy Draw area and one in Cave Creek. To add to the mystery, this hiking area is located on a road called Arizona Highway 51. Whether or not aliens actually landed here, it’s a pretty place to jog, run, hike, or even take a leisurely ride along the easy, paved Dreamy Draw Bikeway. Also in the area is a super challenging trek up Piestewa Peak. The strenuous 1.25 mile climb up to the 2,608 foot summit will challenge even the biggest fitness buffs, although anyone who makes the super steep climb will be rewarded with some pretty awesome views of the valley (even if you complete a short section, the views are still amazing). 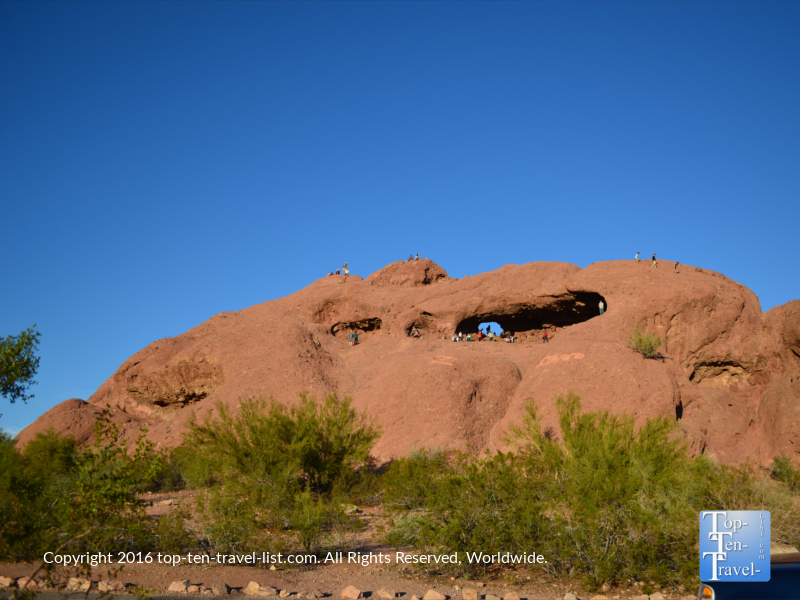 Papago Park is a small park adjacent to the Phoenix Zoo. There are a handful of easy trails here which are perfect for hiking, jogging, or beginner mountain biking. The views of the towering sandstone rock formations definitely make this park stand out from the rest. Hole-in-the-Rock is a unique eroded sandstone rock which was used by ancient tribes to mark the summer solstice. It’s a short little trek up in return for some great city views. Other amenities at Papago include a stocked fishing pond, picnicking tables, golf courses, and the Desert Botanical Gardens.